It is the end of an era for the Abercrombie company. Mike Jeffries, the controversial 70-year-old CEO, is stepping down after years of declining sales and a new push to rebrand the flailing company. Jeffries will no longer be CEO or a member of the board and earlier this year was demoted from his chairman position at the company. Jeffries brought Abercrombie & Fitch to the height of its popularity in the 90s and early aughts, marketing the label as the brand the “cool kids” wear and creating an in-store experience unlike any other teen retailer at the time. Over the years, the company has come under fire for racial discrimination (it used to relegate workers of color to the stockroom), selling thongs and push-up bras to 10 year olds and its look policy, which discriminated against Muslim workers. Abercrombie is currently on the hunt for someone to fill the position and help improve its image with consumers. Teen retailers have been floundering thanks to the popularity of stores like H&M and Zara that provide trendy, more affordable options. It will be important for the next CEO to figure out how to get the company back on top. Following the announcement of his departure, Abercrombie stock has already gone up 7.8 percent. Today’s the day! After weeks of previews, fittings and BTS Instagram photos, the Victoria’s Secret Fashion Show is airing tonight at 10 p.m. EST on CBS. But before you get into the performances, the glittery lingerie and see Ariana Grande get smacked in the face by an Angel wing, Adriana Lima, Lily Aldridge and Martha Hunt want to get you (even more) psyched with the Victoria’s Secret Fashion Show Pre-Show. Join the models for a little pre-show coverage at 9/8c — and you can watch it all right here on theFashionSpot. 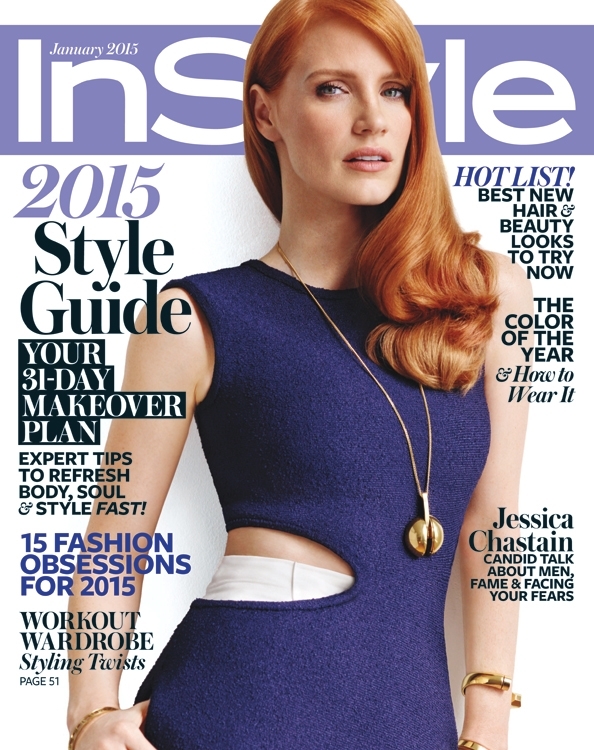 Notice anything different about InStyle‘s cover this month? The magazine has answered our cries and brought back the banner-style masthead. (Forum members voiced their dismay over the banner change with the release of the November 2014 and December 2014 covers.) Now moving on to its first issue of 2015, the magazine has tapped Jessica Chastain as its January cover star and enlisted Giampaolo Sgura (who’s shot every cover since October) to capture the redheaded beauty wearing a dress from Celine’s Spring 2015 collection. The American edition of InStyle made use of Jessica’s photoshoot and commissioned a series of images for inside the January issue, all of which can be viewed on our forums. With Melissa Rubini on styling duties, Renato Campora tending to Jessica’s tresses and Kristofer Buckle applying makeup, we are treated to images that do The Help actress justice. She dons pieces by Vera Wang, The Row, Proenza Schouler and Donna Karan for the cover story. “Jessica looks amazing. Of course it’s a safe image but it’s InStyle. Purple is one of the colors, like green, which pairs faultless[ly] with redheads,” enthused Benn98. We’ve also been treated to a preview of the cover for subscribers, which is different from the one pictured above. “Stunning shot, obviously better than newsstand. I don’t know, they must still drown the image in text for subscribers!” noted Benn98, returning to the thread once again. See inside our InStyle thread and share your own opinion with us here. Retailers these days are getting all up in your biznazz, but don’t worry — it’s just because they want you to buy more of their stuff. The Business of Fashion reports that the growing trend in retail is gathering information on customers to create unique, curated shops to entice the shopper on a personal level. 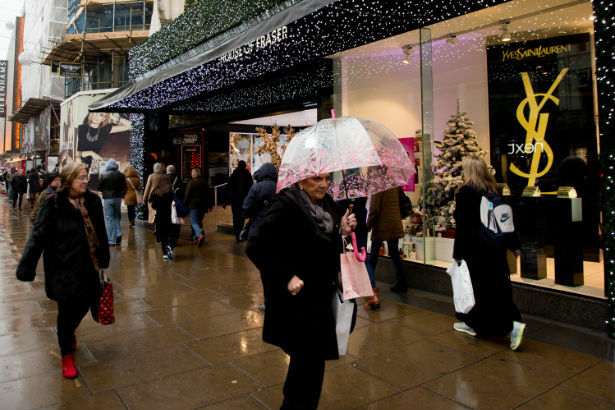 Web analytics seems to be a huge part of this with retailers using data like location, personal taste and past purchases to create a specific shopping experience for customers. On the Internet, e-tailers like Net-a-Porter are using this information to build custom stores for each customer, though there is hope that this data can translate in real life. Burberry’s app allows shop staff to store data on each customer like past purchases in order to help better pinpoint what each customer wants and how to sell it to them. Rebecca Minkoff’s connected SoHo flagship has a similar program. It can keep tabs on what items you buy, or even just try on without purchasing. It is all about collecting the right amount of data, so stores can have a more accurate profile of consumers. Though data collection on the Internet isn’t a new thing, retailers are now trying to bring that experience to life both online and in stores. Of course, for all you Ron Swanson types out there, this method could sound a little invasive. But it looks like you’ll have to get used to it because retailers will do anything to increase sales, and if gathering information on your past purchases is what it takes to sell you another blouse, so be it. If you already love the casual-cool style of Shay Mitchell, the Canadian actress and star of ABC Family’s Pretty Little Liars, get ready to indulge a bit more with her co-founded brand Amore & Vita, now available at Canadian e-tailer eLUXE. Launched with Shay’s best friend and business partner, Michaela Blaney, the limited-edition collection of Los Angeles-inspired, cheeky graphic tees and tanks helps celebrate the brand’s relaunch and blog. Amore & Vita’s soft, cotton T-shirts ($35 to $45) aim to fit any style, dressed up or down. Wear a tee with your favorite stilettos and a leather jacket, or throw on some ripped jeans and fashion high-top sneakers and you’re out the door. Shay recently wore the Unique Clique tee to a morning workout and Michaela sported the A&V logo tank under a leather jacket at a lunch meeting. Are celebrities the new models? Madonna stars in Versace’s Spring 2015 advertising campaign and now Givenchy has tapped Julia Roberts for its brand new campaign, released earlier today via Style.com. Mert Alas and Marcus Piggott, the Turkish duo and long-term favorites of Givenchy designer Riccardo Tisci, captured the Pretty Woman actress with no makeup and posing without flashing her signature million-dollar smile as she showcased Tisci’s coveted collection for the luxury French brand. Naturally, our forum members are voicing their opinions inside the thread with mixed reactions. “I find her to be a great choice. Totally unexpected and I like it,” shared a surprised happytrail, who kicked us off on a positive note. “Love this! Love Julia! Older women fronting major campaigns, should be the norm,” added mepps, also showing enthusiasm toward the campaign. But the images aren’t sitting well with the rest of us and leave us disappointed. “What a surprise!! So happy to see Julia here, she rarely does fashion campaigns but the result is less exciting,” commented an underwhelmed chanelh. 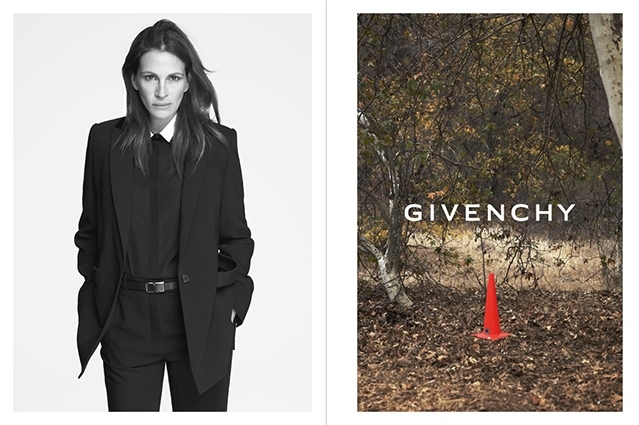 “That’s totally unexpected… But I don’t think Julia really fits for a Givenchy campaign,” agreed Oxymore. Are you excited to see Julia land Givenchy’s ad campaign? Check out some more images and share your own opinion inside the thread here.